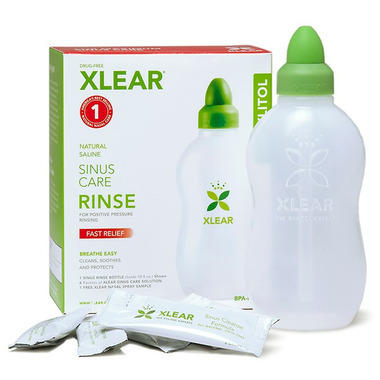 Xlear Sinus Care Rinse Bottle is a specially-made positive pressure rinse bottle with one of the easiest nasal irrigation systems to use. An irrigation system is used to thoroughly rinse out the nasal and sinus passageways. These places often get overloaded with airborne contaminants like bacteria, pollen, and dust. The body attempts to get rid of these pollutants, which often times leaves you with congestion and other flu symptoms. The nasal rinse cleans the passages, relieving the body of these contaminants. Besides the special bottle, the solution offers the many benefits of xylitol, which is a special moisturizing and cleansing agent—not to mention that it’s a natural sweetener too. Recommended Use: Use Xlear Sinus Care Rinse solution twice a day, once in the morning and once in the evening. Xlear is drug-free and safe to use by children and adults, including women who are pregnant or nursing. Xlear got a 5/5 rating from me because I had been suffering from my worst year yet of Spring allergies. My sinuses were so inflamed that I likely had a sinus infection from all the allergy related irritation. It was easy to prepare. Easy to use. I had never used any nasal irrigation products so I read the instructions and followed them. By the second day of use my sinuses were beginning to clear and by the third day I had no more sinus irritation. I used it twice a day to get my results. I would highly recommend Xlear.